Each year 80 to 200 cruising yachts pass Cape Town from the Indian Ocean en-route to the Caribbean – a market waiting for investors. Cape Town’s boatbuilding industry is known the world over for their excellent craftsmanship and innovative designs. Shipyards have built incredible international networks securing market penetration in the Caribean, United States, the Mediterranean and Asia. The city exports 80% of product produced and attracts a positive trade balance of around US$73m annually. 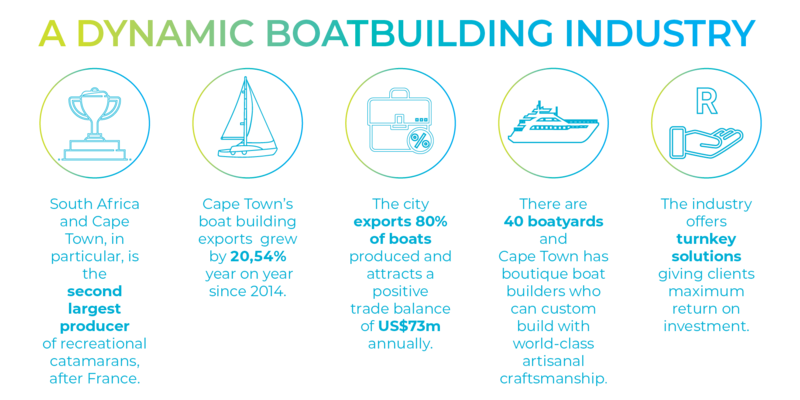 Cape Town’s boatbuilding exports have grown by 20,54% annually year on year since 2014 (Quantec, 2019). And it is the second largest producer of recreational catamarans in the world, after France. If you ask Clinton Johns from Phoenix Marine or Mark Delany from Two Oceans Marine they will both agree with “boatbuilding and navigating the seas are part of Capetonians’, DNA”. 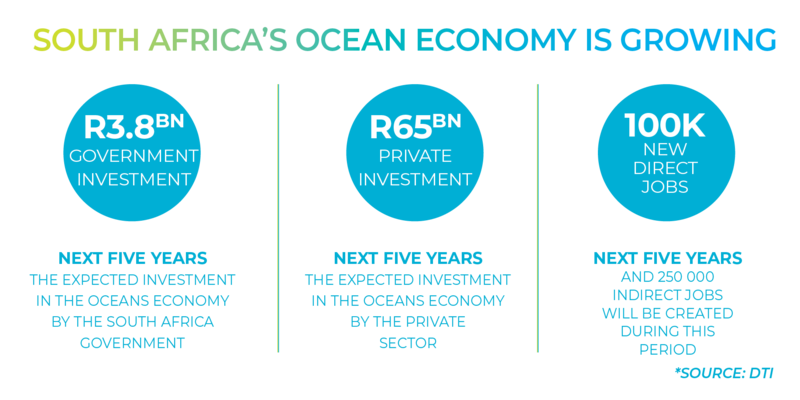 Since 2014 South Africa has secured investments worth R30 billion and created over 7000 direct jobs in the oceans economy. The investments have been mainly in infrastructure development, marine manufacturing, aquaculture, and the oil and gas sector. What sets Cape Town’s boatbuilding apart? It is home to boatbuilding skills unparalleled in Africa and the broader southern hemisphere region. The sector employs directly over 5120 artisans, carpenters, engineers, nautical architects. Thousands more work in secondary industries providing materials and components to shipyards across Cape Town. There are 40 plus shipyards, and Cape Town has boutique boat builders who can custom build your boat with world-class artisanal craftsmanship. Built at the tip of Africa, the Cape of Storms, Cape Town’s boats are made for all sailing conditions. Local manufacturers are easy to deal with as one-stop-shops and help their clients get the maximum return on investment. Cape Town has South Africa’s only boatbuilding school. “False Bay College has approximately 60 students graduating annually with a national certificate. The Western Cape is the largest marine manufacturing centre within South Africa, generating over R2,3 billion in 2018 in exports revenue (Quantec, 2019), and houses approximately 45% of boat builders. Ships, boats and floating structures were Cape Town’s 7th largest value export in 2018. This year five of the top boatbuilders from South Africa exhibited at the Miami International Boat Show. Companies like Phoenix/Xquisite, Royal Cape Catamarans, St Francis Catamarans, Knysna Yacht Company and Robertson&Caine regularly showcase their boats and win awards at sector shows. The industry is supported by the South African Boat Builders Export Council (SABBEX) that often help facilitate investment and conduct research to identify opportunities investment and growth. Currently, SABBEX together with the City of Cape Town and the University of Cape Town are conducting a study about Cape Town’s ocean sports economy. SABBEX estimates ocean sports economy is worth R1.2 billion per year in Cape Town. Ready for investment. Cape Town has a steady stream of young qualified artisans entering the boat building industry. Training colleges work hand-in-hand with the industry to offer of a three-year, full-time course, with six months of each year provided at the academy and the following six months spent in the industry for the industrial experience or work placement. Cape Town companies therefore generally do not have any skills shortages in technical areas. Students learn a wide range of disciplines including design, marine joinery, fibreglass or polymer composite fabrication, metalwork and welding, naval systems, computer-aided drawing (AutoCAD), and boat building standards. “What is great about South Africa for boatbuilding is you have a lot of skilled people, who have been doing it for a long time, and you have great procurement, you can get anything to build the boats with good marine infrastructures, (and) a nice mix of skilled and unskilled labour”, says Phil Berman, President of Balance Catamarans.